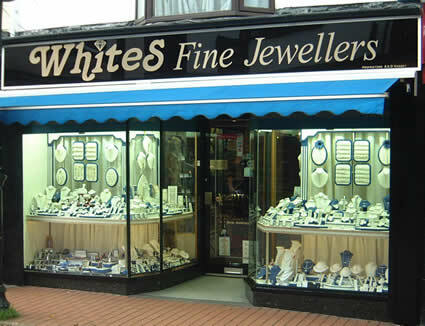 Whites Jewellers was an old family jewellers founded by Mr Whites Grandfather in 1884 in Ripley Derbyshire. In 2001 Mr White retired & sold the business to Steve & Debbie Massey. Steve has always enjoyed & been involved in the jewellery trade. Qualified in the 80s with his Retail Jewellers Diploma R.J.Dip & is a qualified gemmologist gaining his Gemmology Diploma, F.G.A. Also he was awarded the Butterworth Trophy for best student Gemmologist. At 21 years old having become manager of a medium to high class local jewellers felt that he could not progress higher & decided to broaden his horizons by working on large cruise ships in their dedicated jewellery shops.Since then he was offered a position in Bermuda as General Manager Running two busy Jewellers & a Fine Jewellery Workshop. His previous positions gave him good product knowledge & business sense. Then ready & eager to start his own business he was lucky to purchase Whites Jewellers in Ripley, seven years ago. Now having nearly 35 years in the Jewellery trade, Steve has offered a Valuation service for the last 23 years; he is also bench orientated & undertakes many repairs of watches, jewellery & engraving.